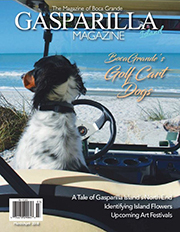 Editor’s Note: This is the second in a series of articles about the forces that have shaped development in Boca Grande and on Gasparilla Island. 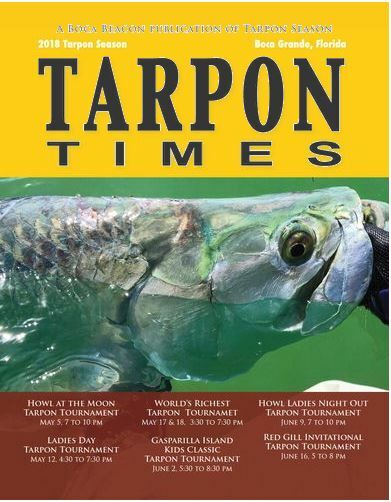 As the tarpon season is getting underway in 1975, a station wagon backs into a gas pump at Millers Marina, rupturing a 5,000-gallon tank. The resulting fire leaves the marina in ruins: a pile of charred bricks, with only a portion of the main dock remaining. 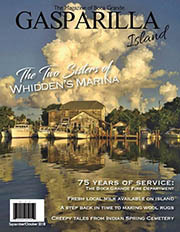 Also destroyed in the blaze are the office and records of the Gasparilla Island Conservation and Improvement Association (GICIA), incorporated four years earlier by marina owner Wyman “Mac” Miller, Lolo Junkin, Norman Smith and Ted Smith. 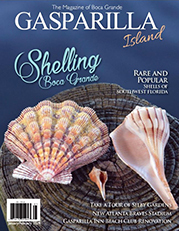 Their goal is to preserve the traditions of Gasparilla Island and protect its inhabitants, including wildlife, from unrestricted growth. Two years after the fire, Mac Miller sells what is left of the marina. The buyer is Jack R. Harper, a one-time 5’ 11” college football all-star for the University of Florida and a former Miami Dolphins running back. Although a seemingly cordial transaction, the sale by Miller carries with it an irony that becomes apparent almost immediately. 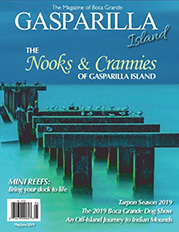 Less than a year later, Harper has become one of the GICIA’s most vocal critics in the organization’s campaign to control Gasparilla Island’s development. 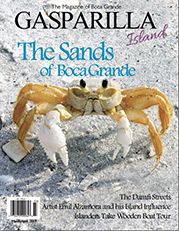 Shortly before going to press for the Jan. 1, 1980 edition of The Boca Beacon, Editor Marnie Banks learned that the Florida Supreme Court had upheld a lower court ruling: The newly adopted Gasparilla Island Historic and Conservation District Act is unconstitutional. The 1979 act was promoted by the GICIA and two area legislators. It made the entirety of Gasparilla Island a historic district, restricted density, zoning and signage and set up a powerful citizen review board to oversee development. “Even though the legislative act was struck down, the issue is not dead. Both (Senator) Warren Henderson and (Representative) Frank Mann have indicated they will go back to the drawing board. When Banks’ article appeared, the GICIA already was regrouping on a new version of the law for Mann and Henderson to carry to the state legislature in Tallahassee. The GICIA’s opponents – Sunset Realty, the Boca Grande Chamber of Commerce and a handful of locals – also were gearing up for another war of words. With its appeal to the Florida courts in 1979, Sunset Realty had struck the first blow against the GICIA’s efforts. The realty company owned a significant amount of land and was concerned about what the GICIA’s actions would do to its property rights, a source speculated. Sunset had been around since 1945, when the Boca Grande Land Company sold lots in the village and all the land north of 19th Street to the realty company for $200,000. Sunset’s business on Boca Grande developed slowly through the 1950s. But by the end of the 1960s, the realty company was looking to promote development northward from 19th Street. In 1969, Sunset developed the Harbor Drive Waterways subdivision behind Miller’s Marina. Four years later, platting was finished for Boca Grande Isles off of 16th Street. Schwartz also wooed the successful real estate team of Ed and Connie Seale and daughter Rebecca to move from Sarasota to Boca Grande in the mid-1970s. They became his independent sales force. “Through the 1970s, Sunset continued its stately march north up the beach to the Charlotte County line. Limiting its business to high-end single-family lots, it sold land but did not participate in the development of the Boca Grande Club, Sea Oats or Seawatch,” Ingram wrote. Joining Sunset in its resistance to the GICIA’s plan was the newly organized Boca Grande Chamber of Commerce. The Chamber’s opposition was not surprising, given its leadership. Robert Johnson, whose family ties to Gasparilla Island date back to the 1800s, was the group’s first president. He viewed the GICIA as “undemocratic” and had dropped his membership in the organization early on. He thought the GICIA’s legislative proposal superfluous. “My father was a lobbyist for the Florida State Pilot’s Association. I knew how cumbersome the process was. If the Gasparilla Island Act was going to be THE comprehensive tool for limiting density and height, then altering it would require a lot of money, a lobbyist and a trip to Tallahassee. It would be very difficult for the average citizen to do anything about it,” he said in a recent interview. Johnson says Lee County had already limited the density through its comprehensive land-use plan adopted in 1979. “So it was redundant in a way,” he said. Despite the Chamber’s strong words, the most vocal critic of the GICIA and its proposal was Jack Harper. Besides being the owner of Miller’s Marina, he was briefly listed on The Beacon masthead as the newspaper’s “publisher.” Some say the title was bestowed when he gave Marnie Banks seed money to help fund her new publication. Harper took full advantage of the newspaper’s willingness to explore differing viewpoints. He authored several columns on the GICIA plan. He also appeared to have some influence on Banks’ thinking. Both expressed support for local control over state oversight. 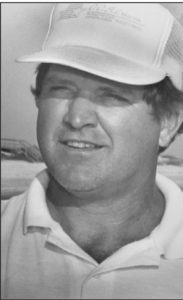 In the Jan. 1, 1980 issue of The Beacon, the former football star explained that after moving to Boca Grande for “some fine fishing and solitude” and taking over the operation of the marina, he “begin to see how difficult it was to operate a business based on only five months of activity. “Since 1970, I have watched restaurants close, businesses come and go and the economy of Boca Grande slide down hill. The main reason the GICIA has pushed so hard for this special act was to stop the current and future planned construction. It seems that this new beachfront construction was not on the same favorable level as the beachfront estates,” he sniped. The GICIA was not deterred by its critics. The organization was on a mission. On March 14, copies of the revised legislation were distributed and discussed at the GICIA’s annual meeting by outgoing president Barney Koren. The plan to have all of Gasparilla Island designated a historic district was gone. Also missing was the local review board that some feared would usurp the powers of Lee and Charlotte County. The new proposal limited construction to five units per acre and froze all commercial, industrial and multifamily development to land that was zoned for such uses prior to the bill’s enactment. Signage also was restricted. Boca Grande Isles, Three Sisters Island, Hoagen’s Key and Loomis Island, as well as the Gasparilla Inn golf course island, were covered. 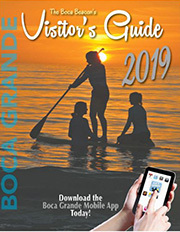 The Boca Grande port property was exempted from the Act until July 1, 1981 so Lee County could have the opportunity to develop a comprehensive plan for the area. The approved bill was filed with the secretary of state and became law without the governor’s signature on July 7, 1980. This time there was no court challenge. All that remained was the public referendum in November 1980. The October 1 Beacon encouraged readers to register and vote: “The referendum has caused an influx of absentee registrations from Boca Grande,” Supervisor of Elections Enid Earle reported – at least 32 in the last three months. In that same issue, the GICIA offered a compelling final plea to the several hundred voters who would decide the island’s fate. 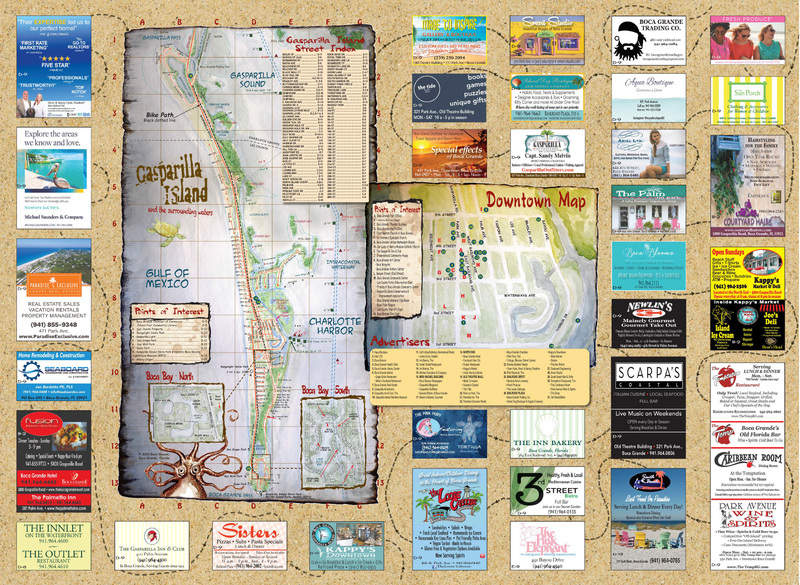 “We are a barrier island. Even the U. S. Congress is finally realizing how dangerous it is to human lives, property and the natural environment to overbuild and overpopulate the barrier islands. This final tally on Election Day was almost three to one: 189 votes for the new district, 65 against and 22 who did not vote on the question. The Beacon called it “a heavy voter turnout,” although it appears that 45 residents who registered did not make it to the polls. The results were gratifying to the GICIA, which reportedly spent $96,000 on the legislation. 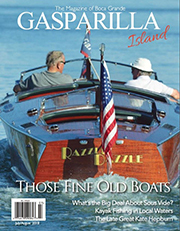 But the referendum did not signal an end to their concern about the fate of Gasparilla Island. The GICIA’s work was just beginning. 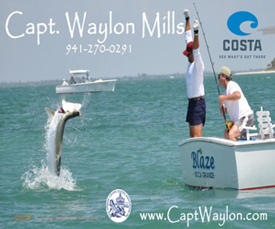 Last year, Frank Mann, now a Lee County commissioner, visited Boca Grande. What he saw pleased him. 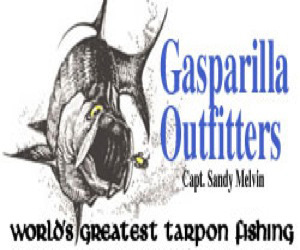 “I take more pride in the Gasparilla Island Act than in almost any other legislation I was involved in. We saved that fragile island,” he said. Next Week: Jack Harper and Sunset Reality continue their battle with the GICIA. 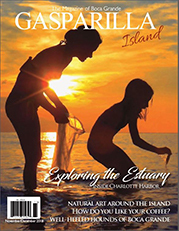 Executive Director Misty Nichols talks about the organization’s ongoing efforts to work with Lee and Charlotte counties in overseeing t he Gasparilla Island Act. *Reported in the GICIA history booklet. CORRECTION TO LAST WEEK’S PHOTO: One of the photos on the front page with Part I of this story identified three people as Mac Miller and Bayard and Mary Sharp. The woman in the photo was actually Pat Miller, not Mary Sharp.